The first thing I noticed about the models he had that were already painted was the lack of contrast. At arms length it was hard to tell that they were anything but white. 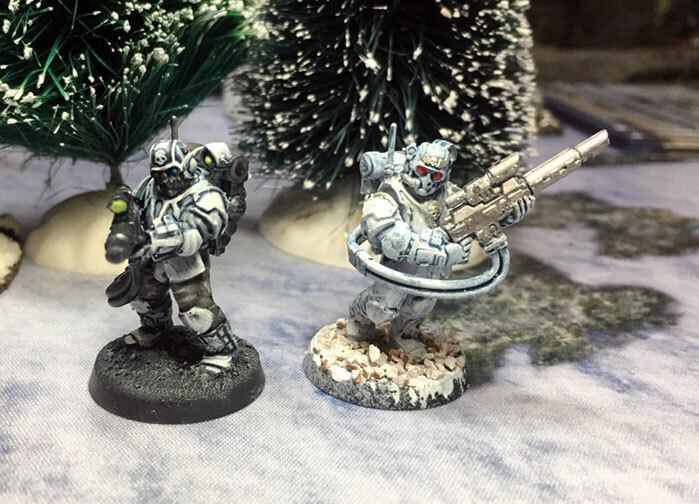 The first step would be to plot out a different scheme that gives the impression of “Arctic Camo” with significantly higher contrast so they pop on the table and look good from arms length. The second thing that bother me was the basing, the chunky rocks didn’t look natural as either ice or rock, and even though I plan on adding snow flock to the bases after I’m done, I don’t think it will look right. Instead I added my standard sand mixture to the new model and went with a dark gray stone color. This give a good contrast between them model and the base. I’m pretty happy with how the test model came out. Unless there’s major tweaks needed I’ll be starting the full force soon.